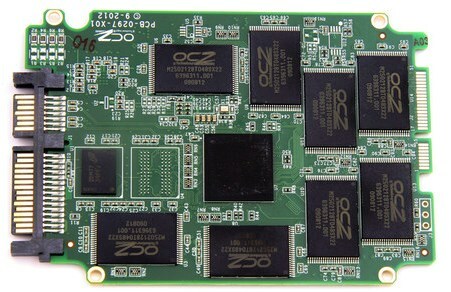 Nordic Hardware writes OCZ is about to launch its Vertex 5 SSDs. The fifth-generation of the company's Vertex series is anticipated to arrive by the end of May 2013, with capacities of 128GB, 256GB, and 512GB. The Vertex 5 could retake the position of being OCZ's flagship product from the Vector series, Vertex 5 is said to be based on the same Barefoot 3 controller as Vector, but with some tweaks. OCZ could use Vertex 5 to strengthen its lineup against Samsung, which appears to have captured the performance segment with its 840 and 840 Pro series, using aggressive pricing, particularly with 840 (non-Pro). Vertex 5 could be based on the same Barefoot 3 platform as Vector, with a few tweaks. It could integrate 20 nm MLC NAND flash. With the company engaged in legal tussles with some of its former investors, it could be interesting to see how the company competes with Samsung's pricing.